Become a snowboard instructor, gaining internationally recognised qualifications, whilst enjoying an extensive fun-packed social programme. Experience a new culture with weekend trips around Canada, plus lots more! We employ the most highly qualified instructors and they work directly for Ski le Gap – we are not just a branch or department of a local snow school. Ski le Gap instructors are handpicked from the best in Canada. All our instructors have the highest Canadian qualification and are professional coaches and course examiners – some are amongst the elite who are qualified to examine the very top (examining Level 4’s) – these instructors will be teaching you! They are passionate about their sport and are dedicated teachers. Every student is allocated a mentor whose job is to ensure maximum personal development and enjoyment so every student feels part of a closely-knit group within the Ski le Gap community. The all-inclusive nature of Ski le Gap is fundamental to the experience. All our students live and eat together, with all meals included 7 days a week. Nightly socials, weekend trips and activities make every minute of your time with Ski le Gap busy and action packed. Mont Tremblant is on the East side of Canada in the French speaking province of Quebec – a true Winter Wonderland. The all-inclusive nature of our courses is fundamental to Ski le Gap – prices include everything shown in the ‘what’s included’ tab. This ensures everyone can do everything on offer together – you might just want a little beer money! Although you will have the opportunity to speak French it is not essential as most people in Tremblant are bilingual. But, if you do want to improve your French we offer weekly French lessons. The key to Ski le Gap’s success lies, without doubt, in its team of staff providing a supportive environment. Students can put their certificate to work during the course with an opportunity to become a real instructor for a week and teach at Tremblant’s Snow School. We offer the chance to gain a variety of internationally recognised qualifications and certificates. We are a family-run business operating exclusively in one resort. This enables us to deliver the best. We have 24 hour staffing onsite, and the director is in resort during the winter season, to ensure the programme exceeds all expectations. Putting an internationally recognised teaching qualification into practice is an invaluable experience. It gives you communication skills, self-confidence and leadership skills. This looks great on your CV! Train with the highest qualified instructors to obtain many qualifications. The more you achieve the more you feel good about yourself, and the better your CV looks. Ski le Gap’s training program is continually being developed by Bruce Eaves, Ski le Gap’s snow director and CSIA Level 4 examiner. All our coaches are Level 4’s. We have a maximum of 8 students in each class with the possibility of changing groups weekly, ensuring students remain in the group that best suits their ability. You will be allocated an instructor as a personal mentor who is responsible for providing extra support and guidance to ensure maximum progression. This enhances the coaching process by providing invaluable personal analysis. Full season pass provided, valid for the entire winter season. 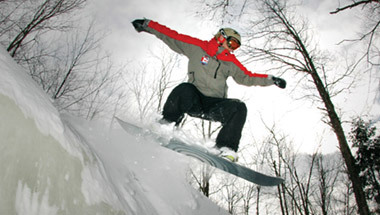 We include the cost of examination fees for your Canadian Association of Snowboard Instructors Level 1 Certification. 1 year subscription to CASI. Specific training in first aid on the slopes. Specific training in freestyle, gate training, moguls and powder. Full accommodation in shared rooms with private bathrooms. All Ski le Gap students live together creating a great community. Breakfast, lunch and freshly prepared evening meal is included every weekday. At the weekend, when students might like a lie-in, we provide a hot brunch and full evening meal. Visit Montreal’s 22km of underground shopping and lively nightlife. Go ice skating on the Rideau Canal on a trip to Canada’s capital city. Participate in winter sports at North America’s biggest Winter Carnival. Learn to build a quinzhee on an outdoor experience like no other. You can’t come to Canada without experiencing a live ice hockey game – a true Canadian experience! Ski le Gap organises a number of different evening events and activities throughout the course - sports nights, theme nights, pub quizzes, house parties and much more! A member of the Ski le Gap team is available 24/7. In case of emergencies a member of staff will always accompany or follow you to the clinic or hospital as necessary. We remain a family run company and so a director will be in the resort throughout the season to ensure courses run smoothly. Transfer to and from Montreal Airport on official course arrival and departure dates. If you want to work as an instructor afterwards, we can guarantee job interviews at the local Tremblant snow school. We can also provide help and advice on employment elsewhere. Ski le Gap will be filming your best moments and creating a video just for you, so the memories are sure to last a lifetime! Discount available to Ski le Gap students in local shops at the mountain.